Have you ever thought about what remedial measures you should take if some sections of your swimming pool are aged after being used some years? With a number of pool features and equipments, it can be a little hard to find out the parts that need to be repaired and the best ways that correspond to figure out. Surely it is always helpful to question at a local professional. Still, some inspecting methods are easy to master and bring considerate benefits to your pool upgrades. Most people think the first step to take when inspecting is to drain the pool, but it is partly true. You are supposed to check the equipments first with a pool of water that has been used a certain time, especially when dirt starts to accumulate and algae grows. This is because in this stage you can do a normal run test on your pool circulation and cleansing system to help you know does it need repair or not, and the test is better to last for some time so that you can receive more accurate data that make it easier to find out the problem. 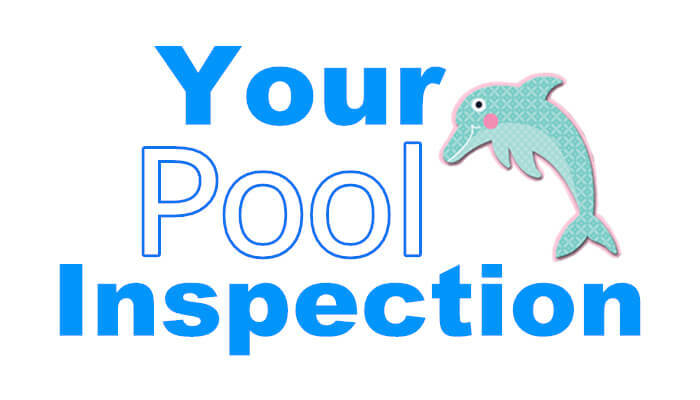 Once you finish inspecting your equipments, you can drain your pool for other inspections. Liner can be the next. A liner can keep the pH level within standard permission and help prevent algae. Although liner is usually made of those erosion-resistant materials such as plastic and vinyl, it may damage due to misuse or wear from outsides. If you find the condition of your liner is not good, just replace it and choose one that have the appealing pattern you like. It is also a good chance to add more vivid details to your pool, don’ t you think? Next you are recommended to inspect some sections of your swimming pool that are relating to safety. Is your locking gate deformed to leave a hole through which your little kids and uninvited guests like stray cats and dogs or wild animals can get in? Is your warning alarm, which will whistle every time when emergency happens, still working? Is your metal stair installed firmly and do the screws go so rusty that will scratch your skin. Inspecting your swimming pool can be a little sterile, but it is a must-do thing however if you want to have a brand new pool. There are many more things about inspection, and BluwhaleTile would love to take pool finishes in details and give you some insightful tips. There may be a frequently asked question: Resurfacing or remodeling, which is a better choice based on a swimming pool that has been used for a while? The answer is that depends on the age and condition of the swimming pool. Generally speaking, when pools get to be used for 15 years, they are supposed to have a general check-up and at least a resurfacing even the maintenance work has been done well these years. When you resurface your pool, that means you have to upgrade your pool interior finishes, and for concrete pools, all the old tiles will be chipped off on the interior surface and retile with the replacement pool tiles. Relatively, it is not a high priced process. It is quite suitable for those who like the original design of the pool but don’t want to make a big change. It is a choice for pools that are maintained in a good condition and the owner just want to make it look renewed. But if a remodeling, this is going to be more costing. However, remodeling also means the pool upgrade is not limited and you have more ways and choices to renovate your pool more than just replacing the classic pool tile with modern pool tile. For example, you might want to add a swim-spa for the physical and physiological need, install water feature like fountain and bubbler that make you swim time more entertaining, or a swim-up bar counter for family party. With a remodeling, you can do many conversions on your pool, like adding a surrounding deck to turn an above ground pool to an in-ground pool, add a pebble walk-in to create a natural environment, or divide the pool into two parts, one is for adults, the other is children. By remodeling, you often can upgrade equipments and controls. It is the easier way for you to practice your dream pool step by step every time when you have energy and budget. 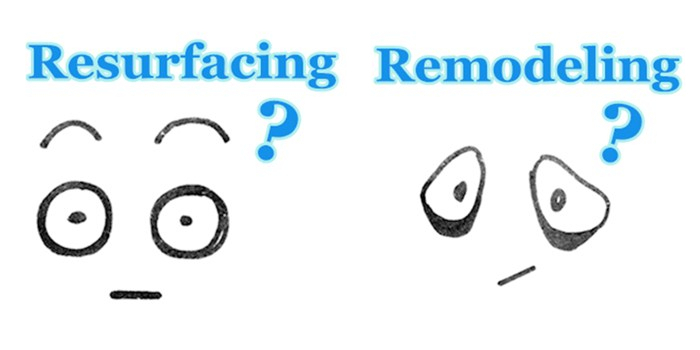 Then which is the best option, resurface or remodel? Here are the tips. If you are planning to have a distinctive pool that is outstanding in the neighboring, it is likely a pool remodeling project can meet your need instead of just a pool tile replacement. And there is a hidden trouble. Provided you have resurfaced your pool several months later, some problems occur and need you to make big changes, and the changes only carry out by chipping off the interior surface to repair those problems eventually anyway. Then the previous resurfacing will become useless work. However, if your pool is really in a great look after being used years and it just need simple repair and you are not planning to add other features, resurfacing is a preferential choice, as it is less costing. BluwhaleTile is a pool tile company dealing with wholesale pool tile for years. We offer customized service on swimming pool mosaic tiles, pool mosaic murals and any related pool accessories for any residential and commercial, small and large swimming pool projects. 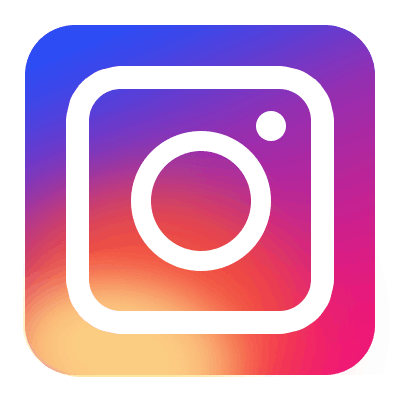 Welcome to contact us TODAY for more info.